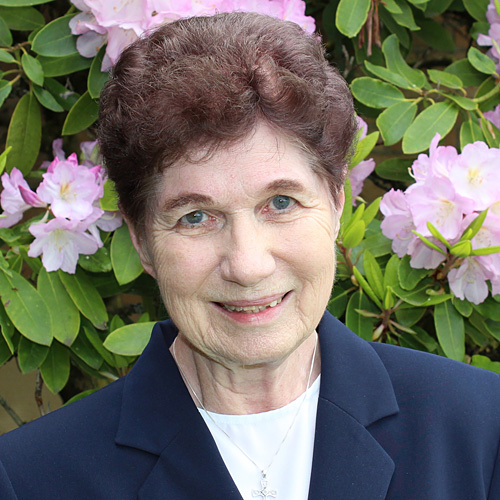 “From the time I was in sixth grade, I was determined to be a Sister of St. Mary of Oregon,” says Sister Rita Rose Stohosky, 82. That determination paid off when she entered the community as an aspirant in September of 1952. (Aspirancy was a special program for high-school girls considering religious life.) By August 1953, she was a novice. Summers were as busy as the school year for Sister Rita Rose, who spent several of them pursuing a master’s degree. She also taught religious vacation school in various states, including Alaska, Idaho, Oregon, and Washington. “We went to places that didn’t have parochial schools,” she explains. When she was not studying, she frequently volunteered at her community’s infirmary and at Maryville, a nursing home founded by the congregation. Doing so inspired her to train as a certified nursing assistant (CNA). Since leaving teaching in 2006, Sister Rita Rose has kept busy with a host of ministries—from volunteering in the pastoral care center of a local hospital to serving at a nearby food bank. She teaches daily in the community’s English for Speakers of Other Languages (ESOL) program, a service she’s been involved with for 12 years. Now age 82, Sister Rita Rose says she strives to live in the moment and in the presence of God. “I am in good health—very good health. I have no cane or walker. My reading glasses are the only thing I need. I’d like to live to be 100, but I realize this is all a gift. Someday, God may have other plans, and I’ll be ready for whatever the Lord sends me,” she says.